John Cena has made his intentions known, he wants to tie Ric Flair's long standing record of being the World Heavyweight Champion 16 times. Growing up in the 80s, "Nature Boy" was the guy I loved to hate. He would lose the title and then regain it. I can remember him surpassing Harley Race's seven reigns, never dreaming Naitch would double that in the years to come. He eventually went from the guy I loved to hate to my all-time favorite wrestler. Flair said on the most recent episode of podast, The Ric Flair Show, that he's not worried if Cena wins the gold again and ties his record. He doesn't think it'll tarnish his legacy. I admire Flair for saying that. I agree, tying the record won't hurt Flair's legacy. But I'm old school and like the guys from my past to stand tall in the record books. Yes, I know it's a predetermined business and at the end of the day it probably doesn't amount to a hill of beans to most. But some fans (like me) take this stuff seriously. I don't think Cena is going to beat AJ Styles for the championship anytime soon. The earliest I see that happening is WrestleMania. It could be a big celebration, but does tying a record warrant a party? Cena is 39 years old. 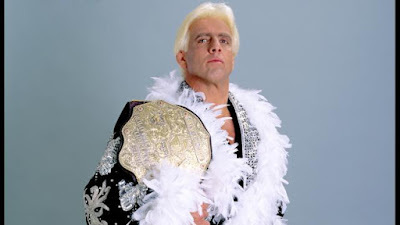 Flair hadn't even come to WWF until age 42 and still won the title there twice and a couple more times in WCW. So there's time for Cena to break the record, which I anticipate will happen at some point. I don't want it to happen, but if Ric Flair is cool with it, who am I to complain? Also if someone is going to set a new record or even tie I can't think of anyone better than Cena to do it.